A collaborative spirit and proper planning were mentioned as keys to the success seen in the Village of Dieterich. 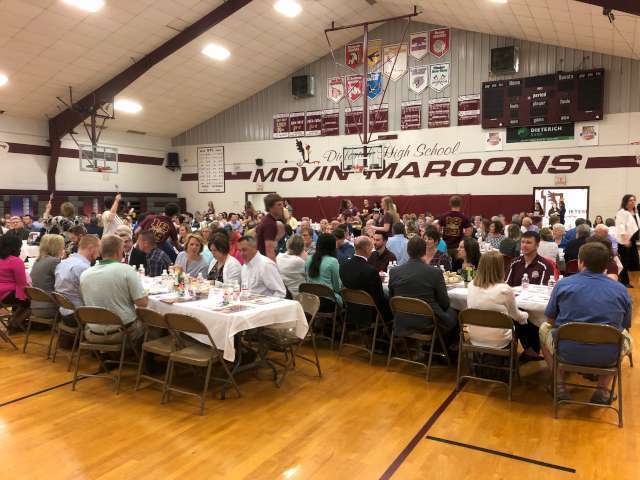 Dieterich was the scene of the latest in a series of Community Celebration of Excellence Breakfasts held Thursday morning in the high school gym. The event featured a panel discussion moderated by Alex Wright of Wright Furniture and Flooring. Panelists were Dieterich Village Clerk and Economic Development Advisor Brittny Gipson, Dr. Michelle Braddy who operates Dieterich Community Medical Center, and Mark Probst, owner of Probst Auto Body of Dieterich. Gipson noted that Dieterich has seen their village board, school board and the Dieterich Community Development Corporation all work together for projects that benefit the community. She said TIF Districts have greatly benefitted the community, particularly in the development of two residential subdivisions that have led to a large influx of people to the village. Another key was the development of E-J Water Corporation that has led to the availability of good and plentiful water for Dieterich and for a large section of this part of the state. Gipson also mentioned that Dieterich community residents were willing to make land available for development. Still another key was the MAPPING meetings held four times over the last 20 years in an effort to determine what residents want for the Dieterich community and how they could make those things happen. Another MAPPING session is to be held in Dieterich this fall. Dr. Braddy said she and her family decided not only to operate a medical center in Dieterich, but to live in the community. She said her family arrived on a cold, wet day, but the warmth of the community was still felt. Her biggest tip? Be nice; it's not only good for the community, but it's the right thing to do. Probst shared his wonder at other Dieterich businesses and said he asked himself "how do they do that?" A key was that he felt "everyone wanted me to succeed." He also advised the CEO students in attendance, and even those in the audience a little older, to find something you're passionate about, and then invest in that passion with your time and talents. Dieterich's history of growth has been traced back to the start of the Dieterich Community Development Corporation, when a group of citizens used their weekly gatherings at a local cafe to discuss what the community needed. One of the first things was a quality water supply, and that was the germination of EJ Water. Whether EJ or whatever, participants in the growth process always come back to Dieterich's collaborative spirit and not much concern for who gets the credit.